By Matthew R. Tommack, D.O. 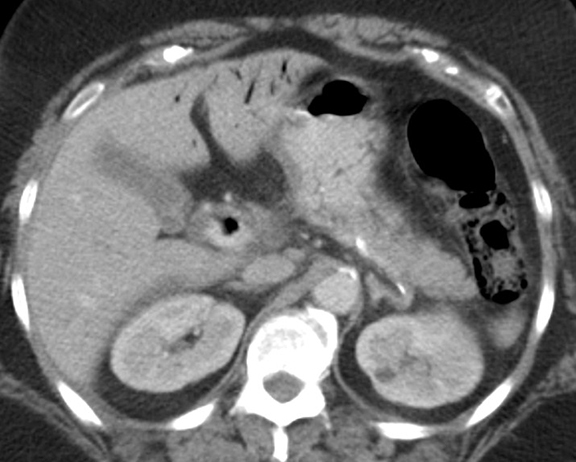 This single axial CT image with oral and intravenous contrast demonstrates portal venous gas in the left lobe of the liver, air in the main portal vein, and air in the wall of the splenic flexure. Pneumatosis intestinalis is a “can’t miss” finding in radiology. Although there are benign causes of this entity, it can be associated with life threatening pathology, such as bowel necrosis. Bowel necrosis is caused by bowel ischemia due to an interruption of the blood supply. Common etiologies include emboli, thrombosis, vasoconstriction, stenosis, and closed-loop obstruction. This may also be seen in sepsis, typhlitis, or in pediatric cases of necrotizing enterocolitis. Radiographic findings include intramural gas, commonly seen along the non-dependent portion of bowel. As bowel ischemia ensues, linear streaks of air may be found within the mesenteric veins and eventually in the portal venous system, as in this case. Portal venous gas within the liver may be differentiated from pneumobilia by its location along the periphery of the liver, as opposed to pneumobilia which is more centrally located. When bowel necrosis is the causative factor of pneumatosis intestinalis, other findings such as bowel wall thickening, inflammatory changes, bowel dilatation, and free fluid may be seen. These patients are generally critically ill with elevated lactic acid levels and a metabolic acidosis. Additional causes of pneumatosis intestinalis include disruption of the bowel mucosa from a recent procedure, peptic ulcers, or inflammatory bowel disease; increased permeability of bowel mucosa secondary to immunosuppression (e.g. AIDS, chemotherapy, and immunosuppressive therapy); and a variety of pulmonary conditions, such as COPD and asthma, which may allow air to dissect through the bronchopulmonary interstitium and into the bowel wall. Tommack MR. At the Viewbox: Pneumatosis Intestinalis With Evidence of Portal Venous Gas. J Am Osteopath Coll Radiol. 2012;1(4):42. Dr. Tommack works with the Department of Diagnostic Radiology, Botsford Hospital, Farmington Hills, MI.